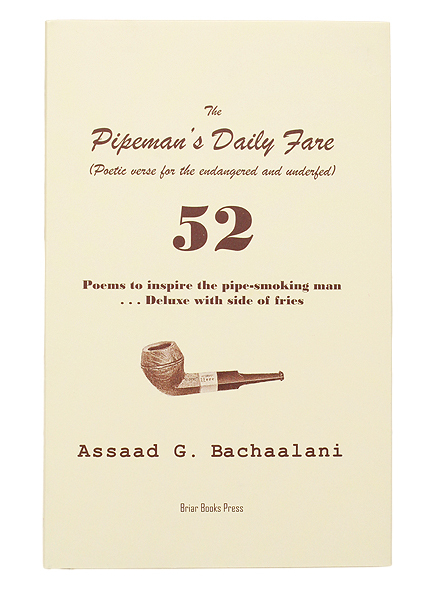 "With a reverence for the past and a youthful taste for the present, Asaad G. Bachaalani has wrought a comprehensive selection of poems and limericks surely to delight the pipeman who demands the most from his smoking sojourns. Topics as diverse as the sandblasted finish, fishing, Dunhill, dogs, Kaywoodie, women, death, the young piper, the best mixtures, pipe gurgle, the new self-conscious smoker, types of collectors, sweet mixtures, driving with a pipe, the master carver versus apprentice, types of briar grain, cigars, pressed tobaccos, pipe cake - and much more. Bachaalani has written a rich, poetic tapestry of words that are soothing on the mind and, unlike a good deal of poetry, written sensibly to exclude no one from its finer meaning and enjoyment." Yes, pipe poetry. If this sounds like an unusual genre of writing, well, that's because these days, it is. Nonetheless, if you look back at pipe-related publications of old, there once was a time when it was not so uncommon an indulgence for pipemen to dabble in. Writer, student and pipe man Assaad G. Bachaalani has brought it back however, producing in The Pipeman's Daily Fare (Poetic verse for the endangered and underfed)what is, to the best of our knowledge, the first book of pipe-poetry to see print in many generations - and possibly the first ever that has been entirely composed by a single writer. Fitting to this rather antiquarian theme, the young author's turned up a wealth of classic pipe design illustrations to accompany his fifty-two original poems and musings contained within, drawn from the 1921 trade list of the Civic Company of London. And, as is only natural, a Briar Books publication would hardly be complete without a forward by Gary B. Schrier himself, as well. Nice little book of poetry to read while smoking your pipe, or just a quick read.